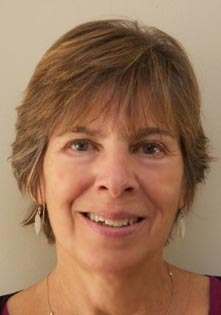 Alumni Parent Helen Steinberg celebrates The Field School in its fortieth year by sharing her thoughts and impressions of the school. Before my daughter Arielle applied to The Field School, in 1994, I had heard the name, Elizabeth Ely, echoed through the years. When anyone mentioned Elizabeth, it was always in the context of her incredible talents as an educator, her amazing intuition about the needs of kids, her humanity and her dedication to a diverse educational environment. For many years, I wondered, who is this woman and how will I ever meet her? Well, the moment came when I accompanied Arielle to her interview, yes, the famous admissions interview, for which I wasn’t fully prepared. I had never experienced anything like it. As soon as we entered Elizabeth’s warm and worn office, with her big, beautiful wooden desk, decorated by students’ paintings, photographs and ceramic pieces, I knew that The Field School was unlike any educational setting that I had experienced. And there was no doubt in my mind that Elizabeth was not your typical Head of School. She immediately put Arielle at ease and asked the most interesting and unexpected questions, such as, “if you won a million dollars, how would you spend it?” Initially caught off guard, I listened to Arielle’s thoughtful answer and realized that Elizabeth’s focus was on one’s character and humanity, not so much on the mundane “what’s your favorite subject” questions. She listened intently and responded warmly. At that moment, I realized that Field was a very special place, led by a very special person. When Elizabeth asked me to be the first President of the Parents Association, I was thrilled because I knew that we could try to ease the workload and demands of the faculty. This was a time when Elizabeth and the Board faced the difficult reality that Field needed a new home, and the search for the perfect location was underway. Elizabeth knew that if Field was to move, it had to stay Field. That meant that she didn’t want a standard, rectangular-shaped school – the shape, colors, furniture and setting had to feel warm and cozy. With the torch passed on to Dale, The Field School has continued in its original mission of nurturing it students, while engaging them in a challenging and creative curriculum. With veteran faculty, such as Will, Natalia and Chris and an outstanding new faculty and staff, we know that The Field School is on solid ground. The juniors, along with the English 11 teachers, smile before heading off campus for a Transcendentalism-related field trip. The week before spring break all 11th grade students, along with families and faculty, enjoyed a Transcendentalism Evening at school. This was part of a culminating third quarter project that English 11 does every year, in which students study Transcendentalist authors – Thoreau, Emerson, Dickinson, Whitman – and then create their own projects out of the inspiration that comes with the many readings they have completed and discussions they have had. A handful of the parents who attended the Transcendentalism Evening shared their thoughts on the event. Tracy A. Zorpette: The teachers asked the students to go deeper with the ideas presented by the Transcendentalists — and the students delivered. From pressure to conform, to solitude, to living simply, to being part of the natural world, the students vigorously and creatively engaged with the themes of Emerson, Thoreau, Dickinson and Whitman. These teenagers made themselves vulnerable in their honesty and exposure of their hopes, fears and struggles. Bravo to the teachers for nurturing them through these turbulent years, and to the school as a whole for insisting on an education that goes beyond test scores. Salma and Arif Ali: Arif and I were completely blown away by the evening. We noted to each other that this is exactly why we chose Field. You have a unique way of encouraging each student to reveal their texture, and to celebrate who they are at this moment, while they continue on their journey. Thank you. A great, big, sincere, heartfelt thank you. Students and parents admire the work on display during the Transcendentalism Evening. 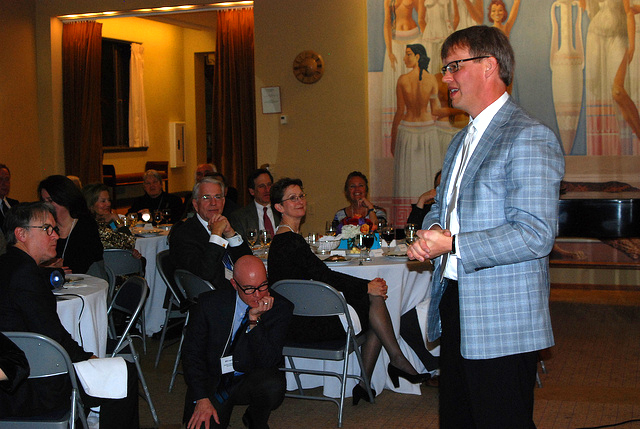 Deborah Ellick: Stephen and I were touched, entertained, educated and amazed at the Transcendentalism evening. We loved how the students made conscientious efforts to go out of their comfort zone to discuss some hard but realistic life issues. It is not easy at 17 years old to dig deep into the meaning and psychology of the author’s writings to find depth and purpose in their own lives and compare them to the authors of an entirely different generation. The English project that Field requires for the students to learn was eye opening for our son and clearly for the students who presented Tuesday night. Hooray for Field students for sharing their experiences. Thanks for sharing a piece of you with the parent community. We applaud you. Jodee A. Z. Lichtenstein: We were so impressed with how open the presenters were and how respectful, kind and supportive the student audience was. I think this is unique at Field to find a student body so supportive of their peers. We were impressed by the quality of the final projects and the amount of work and thought that was put into the projects. Lastly, we were impressed by the teachers and how supportive and pleased they were about their student projects. You could see in the teachers eyes and actions how moved they were by the work their students put forth. Penny Catterall: I loved how honest and open the students were about their experiences and what they learned about themselves, even if it was somewhat difficult for them to discuss in public. I also really enjoyed the diversity of projects, from art to film to poetry. It was great to see how many different directions students were able to take from this one unit! Susie Antebi: I really was very impressed with the candid and honest presentations of the students. I was moved by their sincerity and their fragility. 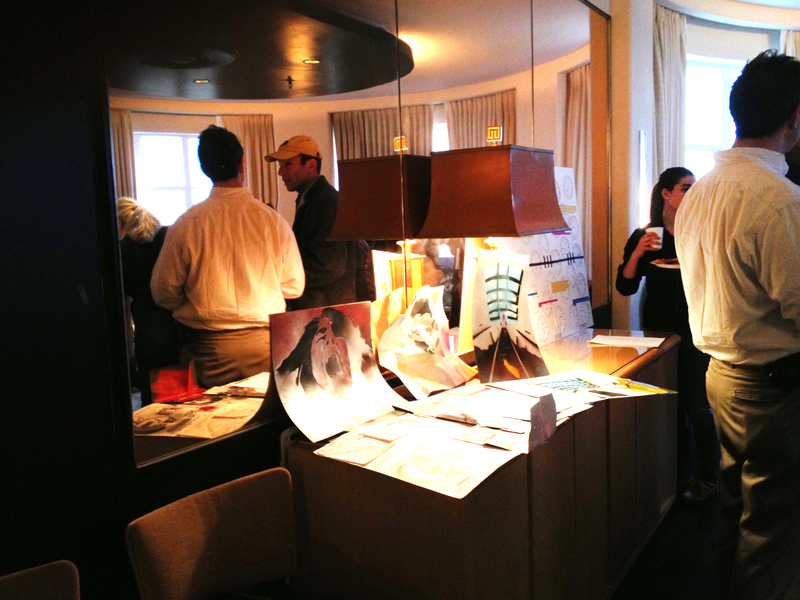 They captured the essence of the project and the incredible display of creativity was amazing. A group of The Field School internship mentors pose in their Team WIN t-shirts. Winter Internship is a unique program to The Field School that has been in place since 1976. It began with the intention of providing students with a chance to spend two weeks pursuing fields of interest that would allow them to learn, grow, and gain new experiences outside of the classroom. Below are several students’ account of their most recent Winter Internship. Ezra Wright learns about wild species of birds during his internship with the Anacostia Raptor Watch. Jules and Ezra then sent their draft out to all members of the Earth Conservation Corps community — an impressive feat for two high school students! Their work was integral to the creation of the article and subsequently to the entire organization. Max Liffman helped out, over internship, at Bethesda Pet Shoppe, where he was immersed in many aspects of the retail pet business. He did much feeding of the animals, cleaned cages, inventory work, helped customers and even was able to learn how to use the register. His hosts loved him and would have hired him if he were old enough! 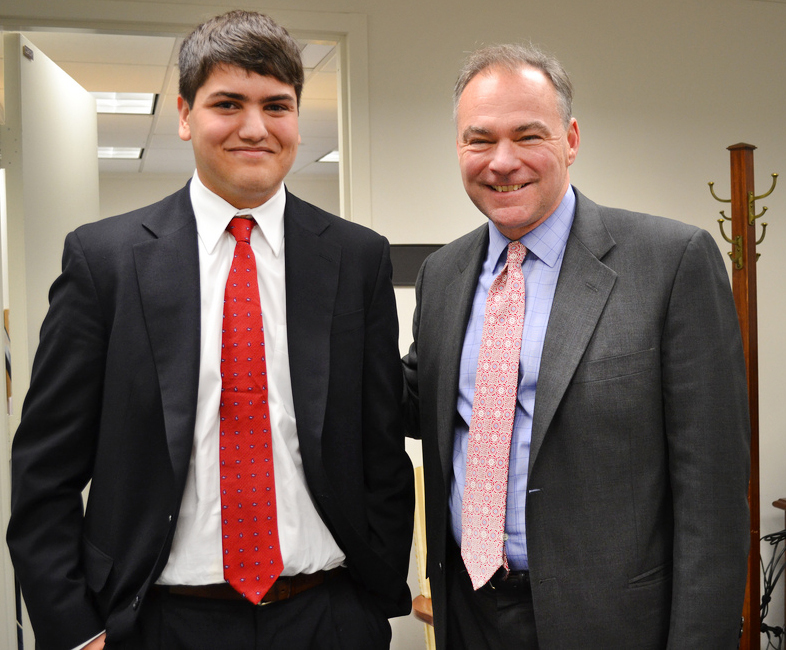 Steven Brenner poses for a smile in the office with Senator Tim Kaine. Steven had worked on the Kaine campaign during the summer and fall, so he knew the ropes, and understood the tasks of setting up a new Senate office. Steven’s supervisors kept saying how lucky they were to have him, that he was a huge help, and that they were going to miss him when internship ended. Eva Shuman earns her WIN button. By the end of Eva’s internship she was leading tours of new volunteers and showing them the ropes of the program. She was described as superior in every way. Her hosts were impressed with her confidence and skills and her ability to handle every task passed her way. Yet another successful internship experience from The Field School! Brandon Golden, in his element. Brandon Golden has worked in three film internships, starting with Guggenheim Productions in grade 10, and Loki Films with Alumni Rachel Grady in 11th. This year Brandon assisted with a TV show called Turn and Burn, writing transcripts and pitching his own ideas. “I enjoyed using advanced software,” Brandon added. “I got good learning experiences for [the future].” These will come especially in handy over the summer, because Brandon was offered a summer internship to continue his work. Kendall’s supervisor, as well as another owner of the company, expressed their pleasure with Kendall’s performance in the office. They noted how great Kendall was at self-managing herself throughout the day – a truly successful first Field internship experience for Social Driver. 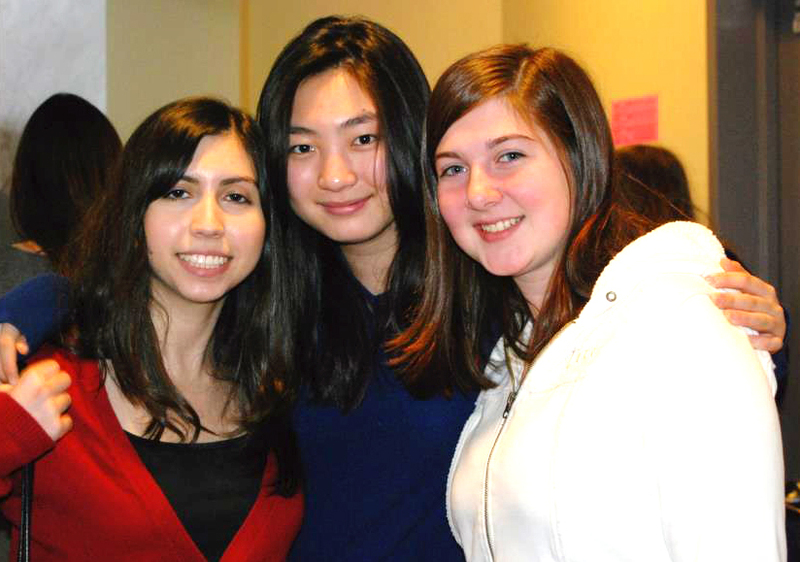 Jana Cohen is in the center, posing with several other middle school students. 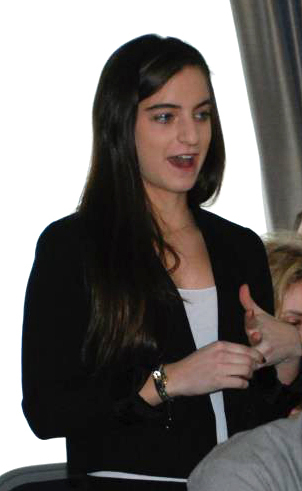 Jana Cohen interned at her former elementary school, Janney, in a 3rd grade classroom. She was a wonderful asset to the teacher and school. The teacher Jana was working with took ill during the second week of internship and had set up a lesson plan for text-based discussions about local, state and federal governments as well as the Bill of Rights. It turned out that the substitute was confident enough in Jana to have her lead the class on those subjects while the substitute observed. Jana did a terrific job presenting the material and leading the class in discussion. Roy Seitz-McLeese and Aaron Kopchik interned at the Naval Surface Warfare Center. From the Naval Surface Warfare Center Host: “For activities, we first started each student with learning a new skill. Both were introduced to the Computer Aided Design software package, Rhino. Both Roy and Aaron picked up on the tool quickly and they finished the tutorials in record time. We then introduced them to Navy hull form design by having them generate hull shapes through a computer program called HULLGEN. Next up for them was creating a 3-D model of a shaft dynamometer that will be used for an upcoming Navy submarine test. 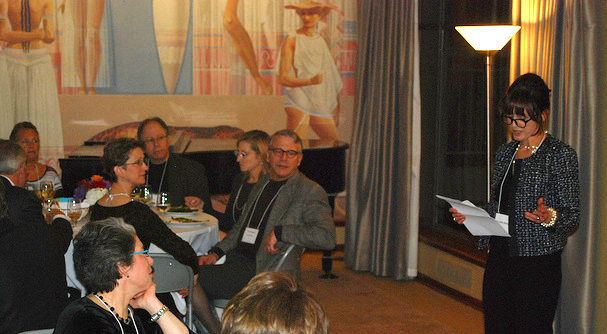 On Saturday evening, March 2, 2013, The Field School held a dinner in the Cafrtiz Living Room for all its current and former trustees. This was the third “reunion” for the people who have acted as the stewards for Field’s development since its origin in 1972 in The Wonder Building, just north of Dupont Circle. It was a wonderful evening, bringing together dozens of people who have helped the school to grow, to thrive, and to educate generations of brilliant young people. The Field School is grateful to every one of its trustees, past and present. I came to Field in 1977. Field was in its infancy, but it was the only school I’ve been to before or since, that didn’t have a baby-food approach to education. Field wasn’t teachers coaxing tiny spoonfuls of Shakespeare down our throats. Field was an intellectual brawl. Field was Sharaine Ely perched on a stool, with a scarf around her neck, having us read 18th century poems about seduction and passion. Out loud. In front of each other. Boys and girls. Once we realized, and we all did at once, that “a spangled breastplate” was a bra, and that this guy wanted this girl to take hers off—we were hooked – I still read 18th century poetry. Sharaine not only woke us up to John Donne and Ben Johnson, she woke us up to our minds, which is the greatest and rarest gift a teacher can give. Sharaine was the kind of teacher most people get, if they’re lucky, once. At Field, she stood tall but not alone. Elizabeth knew how to pick teachers: Mark Olcott turned the chaotic jumble of history into an orderly sequence of cause and effect. The stream that was early America became a widening and deepening river that rolled towards us. David Lear taught Economic History using Galbraith’s “Age of Uncertainty” and Heilbronner’s “The Worldy Philosophers” for text books. Both books started with Adam Smith, trudged through the Industrial Revolution, Karl Marx and the World Wars, but one came from a liberal perspective and one from a conservative. That was Elizabeth all over. She didn’t want to drive us to her point of view, or the school’s, she wanted to drive us to think. She encouraged the teachers to give thesis and anti-thesis, so we could come to our own synthesis. Very few schools do this and yet it’s what education really is. The right to think was a deeply-held value for Elizabeth. She understood that in order to risk thinking, people and especially young ones, have to feel safe. So she made a school where they were. One of the people we read and debated about in Economic History was a man with the delightfully Wodehousian name of Thornstein Veblan. Mr. Veblan had ticked off every one of the 400 families that made up 19th century society in New York by comparing them to the primitives tribes of New Guinea. Both, he wrote, liked to wear their wealth on their bodies, (coining the phrase “conspicuous consumption”), both steered their children into marriages that were at least partly, mercantile arrangements, and both shunned people who were different. Thornstein Veblen was right, most of the world does operate along tribal lines, but I remember thinking that Field was an exception. At Field, people had their friends, but no one group was deemed superior, and no one was shunned. There was one boy in my class who wore a three piece suit to school every day, with a tie – this was in the 70’s – he was not only liked, he was respected. That was a direct reflection of Elizabeth’s values. She respected him, as she respected all of us. It didn’t matter that he didn’t dress like the rest of the tribe. He mattered because humanity matters. Elizabeth built a school where it was okay to risk saying the wrong, silly, odd or dumb thing. Coming to Field was the beginning, for many children, of unclenching. Nothing grows when it’s clenched, at least not as it’s meant to. Under Elizabeth, children straightened up and reached for the sun. In April of 2003, my brother, a reporter covering the war, was killed in Iraq. In one phone call, the family we were was gone forever. My husband and I packed up our two children, Sally and Tommy and moved back to Washington to be with my parents. It was June. Sally was going to be a sophomore and we lived in North East where the high school was failing. I called Elizabeth, not because she was the founder of The Field School, but because she was one of the touchstones in my life. As I drove up to the new campus, she was standing outside the Cafritz House, waiting for me. I didn’t even park; I just got out and ran into her arms. It was like coming home. I never did ask her advice about where to send Sally. I never had to. Before the hug was over, she’d invited Sally to Field. I was so happy that my dear daughter was going to be under Elizabeth’s wing, and so upset when Elizabeth flew away. It took me a while to see that Field was still Field. It started with seeing Sally smile all the time. She’s always been a smiley child. But death ends the care-free part of childhood and Sally had been somber since my brother’s. Field made her care-free again. It didn’t know it was possible and am still grateful and amazed. Then there was the day when she said, “You know what I love about Field? Nobody judges you.” It was like hearing my voice echo back after almost thirty years. Then there were her teachers, the great poetry she wrote, the math tests she flunked, the excitement when she talked about her classes, especially Tait’s. She was thrilled. I didn’t have to remember that thrill, it’s still with me. The thrill of finding your mind, what it’s good at, what it stinks at and what rockets it to the next stratosphere lasts forever. This fall my son Tommy started Field as a junior. When I dropped him off on his first day, I saw Will Layman leading a band up to the balcony to play welcoming music. I suddenly remembered walking up to Field on my first day with my little sister, Nell. A boy was on the porch welcoming people with an Italian opera, making it up as he went along. I drove off teary with happiness about the great journey Tommy was about to begin—and a little worried. Field was no longer in its infancy. It had grown-up pressures and grown-up competition and Elizabeth was gone. I wondered if grown-up Field still had room for smart kids who don’t get smart kid grades. Or kind kids who aren’t going to an Ivy. Or kids who would rather kick a soccer ball than read a book. Or kids who were playing catch-up because they couldn’t hear when they were little. I hoped so because Tommy was all of those kids. Tommy’s voice quickly became part of what is now, a family echo. When he talks about not being able to figure out if a teacher votes Republican or Democrat because the teacher gives them both points of view, I think of my teachers giving us thesis and anti-thesis, so we could learn to think. When he talks about how nice the kids are, I think of the boy who wore the suit and tie to school every day. Looking different still doesn’t matter at Field, humanity still does. When he talks about loving school, loving his teachers, his friends, the kids, poker club with Chris Lorraine, Officer Bill, Dale and classes (first time loving classes), I see a through-line connecting the teachers I had, to the teachers Sally had and the ones Tommy now has. Field is still a place where exceptional teachers with exceptional hearts and minds are trusted to find their own way to teach and reach kids. When alumni talk of how Field changed their lives, one of the things we mean is how it informed our lives. The lessons I learned at Field still help me put things into context. One of them, again from economic history, was the Hegalian Law of Change: everything living must grow or decay; it can not stay the same. That truth will sometimes break your heart, but, as I’ve learned in the last eight years, not always. Field today is different than Field of my day, so is the world and so is Washington D.C. In the 70’s, this was a town where people left work at five o’clock; now you can’t throw a brick (not that you would) without hitting someone who got up at 4 am to train for a marathon before going to the office to put in a twelve hour day. Field has to adapt and they have, I think, beautifully. As Hegal said, things do change. Schools and children grow up. But when they are rooted in values, they grow up to be someone we still love, who still feels like home. I feel at home at Field because Elizabeth’s philosophies, values and beliefs are part of the school itself. Dale’s commitment to using them as the school’s touchstone to guide growth is firm integrating them is a priority. When I drop Tommy off, or come to a game, I see unclenched kids reaching for the sun. There are still parents who want their child to be excited by school rather than burdened by it. And they bring them to Field. So to all of you who have served on the board, past and present, be assured the foundation Elizabeth laid – a lively approach to education, respect for an individual’s mind, a commitment to free-thinking – are still the blocks Field is building on. And as long as it does, Field will always be an exceptional school. This year for community service, a group of Field School students, faculty, and parents went to Leckie Elementary School to do a variety of deeds to help this school become a more enjoyable place to learn and prosper. 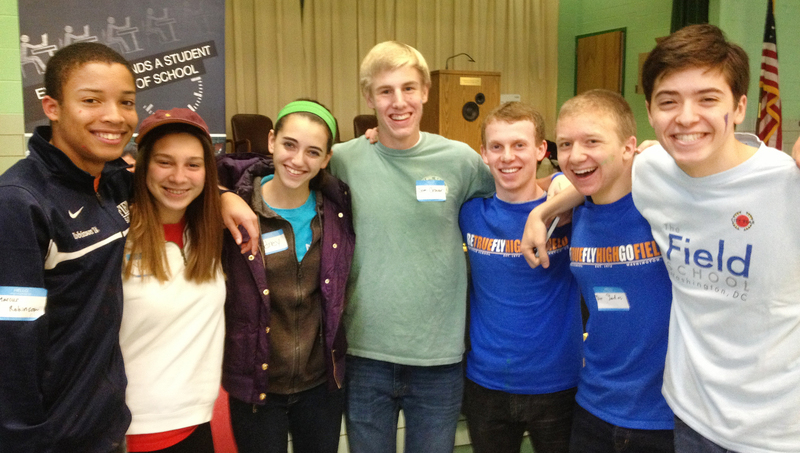 Since I was not able to go to last year’s service day, I was more than eager to help these students and this school. As I arrived, I had to choose between four groups: building flower boxes, benches, cabinets, or painting signs. Since I have a love for carpentry, I quickly put my name down for the group that was building benches. I wanted to be rewarded at the end of the day by sitting on the beautiful bench that I had just completed. Once I collected all the wood needed to build, I went right into it, along with my dad and fellow Field student, Marcus Robinson. We hammered nail after nail, and made sure everything was as good as we could assemble it, because we wanted these kids to be able to sit back after a long day on the ball fields at recess and just relax. When we finished putting all the wood together, it was time for the paint job. We added a nice red paint to the wood with a rusty feel to it, which made the bench stick out. As I looked down at the bench Marcus and I created, all I was thinking about was how this bench is going to affect the community and that there is nothing better than giving back to a school who needs more than we do. This is not the kind of experience that will go in one ear and out the other, this will be cemented in my brain and influence me to do more service jobs like this in the future. Thank you City Year! Field offers and hosts some wonderful events every year. Homecoming and Founders Day are probably at the top of most students lists. I believe that there is one more event that should be added to these lists: volunteering with City Year Washington DC. There are many reasons why I believe City Year should be included in these lists. Working with City Year combines so many types of fun. I look forward to this day every year! Working with City Year is such a blast. Not only do you get to hang out with members of the Field community (parents, faculty, students, alumni) but you get to help those in need. One of my favorite things about Field is the balance between having fun and working hard. 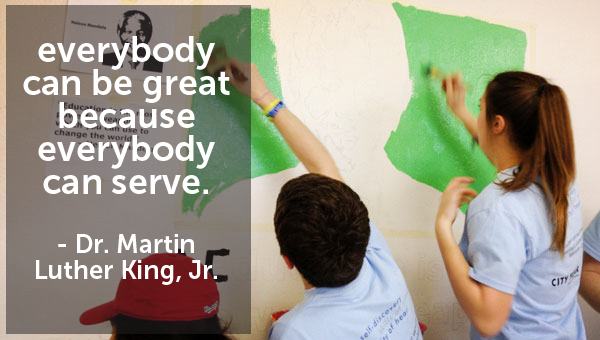 City Year encompasses both of these attributes. Whether you are painting murals with parents of a seventh grader you have never met, or building benches with your two best friends, you’re working hard while having fun. On top of having an awesome time and working hard, working with City Year incorporates one of the three prongs of Field’s mission statements: Generosity of Heart. As described by Assistant Head of School, David Buffum, Generosity of Heart “which speaks for itself: be kind to other people, reach out, make [Field] a comfortable place as it is a comfortable place for you.” While working with City Year, Field is helping to create a greater learning environment, reaching out to students/schools in need, and selflessly being kind to complete strangers. I was thankful to be with friends last Saturday morning at Leckie Elementary School!! I loved everything about City Year last year, and was excited to hear that Field was going to do another trip this year. Last year, Field built bookshelves, painted murals, and danced with the kids at Garfield Elementary. I not only enjoyed painting murals, which was my task, but I also enjoyed seeing how hard everyone else was working. But, not only were people working hard, but having a total blast with their friends and teachers! I completely forgot that my teachers were my teachers. They were just my adult buddies wearing Field service day shirts. Seriously. It was an incredible feeling to know that. I think City Year has and will always continue doing an amazing job with what they do. Last year I was more than impressed and inspired with the things they were doing. Painting murals? Genius! Not only was it fun to do, but beautiful as an end result. Same thing this year: I decided to paint. This time, we painted inspirational words on benches! How creative? Super creative I say! Others built benches and also picnic tables. By the end of the four hard-working hours, I saw how proud everyone felt, and so did I! 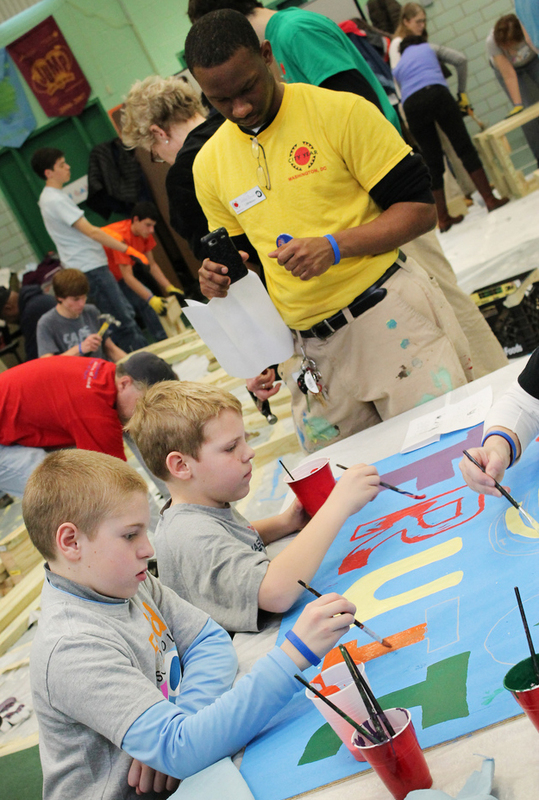 I would work with City Year five million more times. A lot of students from Field who participated at the service trip on March 23rd mentioned how they would want Field to do this kind of trip every season, once more in the fall and spring of the school year. I do not disagree with that at all. I enjoyed giving my time to others and knowing that I contributed to another community. City Year is one of my favorite events at Field, and would love to have this service trip to be a regular event at Field, especially when I graduate. It’s nice to know that a service day each year can continue to make others excited to give their time and help out. Mollie Schear ’12, speaks to the seniors about her college experiences so far. Several Field alumni share their thoughts on returning to Field for the annual senior-young alumni lunch, where the grads discuss life after Field with the soon-to-be most recently graduated senior class. For me being at Field has always been a treat and this visit in particular was a special one. It was my first appearance back as an alumna. Everything felt different to me. I was no longer rushing in line to get lunch or cramming to sit in the Hub. I could be an outsider visiting the places where I used to live. Having been through a semester of college, I felt that it was time to go back to my roots and offer my experiences to The Field School class of 2013 because in just a few months they would graduate and start a new part of their life, just like me. To the class of 2013: Although we only had 80 minutes to shed light upon one of the biggest journeys of anyone’s life, we did our best as an alumni panel to illuminate anything and everything that could be thrown your way. People talked about the important details of making friends that will last, and about managing time wisely. As an alumni panel we also felt that it was key to stress was a truly great leap this experience is, and how important it is to take it all in and enjoy. I was also able to throw in my two cents about getting into sports and sciences in college, which are both great time commitments that shouldn’t be taken lightly. The alumni panel listens to questions posed to them by the seniors. The alumni lunch is such an important and meaningful opportunity for the seniors to hear from a diverse group of people about their college and gap year experiences. Some of us, like me, have only been out of Field for a semester, while others have been out of Field for four years and are about to complete or have already completed college. I remember last year sitting in a crowd of seniors feeling like I had the scariest thing in the world in front me, but I wish I could have told my senior self now to really listen to what the alumni had to offer. Everything that was touched upon in the lunch I have now either experienced first hand or seen happen to a friend. The lunch is a helpful tradition for seniors but also alumni because it establishes a culture of sharing experiences and validating the feelings that we all felt our first few months of college. It was great to see my fellow classmates and alums back at Field. Coco Wang smiles with two friends before sitting down to chat about college. Coco Wang, class of 2012, took the time to also share her thoughts both on college and on returning to Field as an alumna. Even though there are a lot of physical changes to Field, such as new renovations, my feelings towards the school have not changed. It’s always intimate, warm and home-like. I think the most important thing for the seniors to understand about college is that they need to learn how to protect and utilize their time. And of course, college is fun and I’m sure they will all enjoy it! Kevin Gardner, class of 2012, chimed in with his thoughts as well. Visiting Field was a great experience. I have been so excited about the college experience and what I have learned, I have just been itching to tell my peers about it. Not so much the classes I have been taking, but rather how I have approached the whole experience. I feel that college is as much about the attitude you have when you approach it as it is the feelings you have during it. I want the seniors to know as much as they can about the approach to college for two reasons. First, to alleviate any nervousness they may have about it and second, so that they can have the best experience when they first arrive at college. Visiting Field as a recent graduate made me feel at home. I know I am no longer an active member of the community, but I am always welcome to be involved. On December 5th eight Field students and eight Field faculty members attended a three-day long conference, the Student Diversity Leadership and People of Color Conference, in Houston, Texas. “Although life-changing sounds kind of cheesy, I have to admit, that really describes my experience at SDLC,” said 10th grader Maya Nagan. “I haven’t opened up to people like that in a really long time.” This sentiment was shared by the Field faculty and student attendees alike. When the Field group first arrived in Houston on Wednesday night they registered for conferences and workshops, enjoyed a dinner at the Houston Downtown Aquarium, and prepared themselves for a busy few days. Each day of the conference started with breakfast at 7:00 am. On Thursday the 6th there was an opening ceremony which included dance performances by local Houston high schoolers and a welcome talk given by Helene Cooper, White House correspondent for The New York Times and best-selling author. Following the opening ceremony the 16 Field attendees scattered to attend various conferences. For PoCC members, the day ended around 6:30 with a reception afterwards. SDLC ended at 10:00 pm on Thursday and 11:15 on Friday–very long days for the students who attended discussions and workshops in “Family Groups” as well as affinity groups. At night, our Field students and faculty met in a hotel room to debrief. On the last day, Saturday, student SDLC and faculty PoCC joined together first for an affinity session and then second in regional groups, where they met with not only each other, but also with students and faculty from other independent schools in the DC area. This last workshop was led by the students, where they arranged a “fishbowl” conversation setting, asking questions of everyone on topics ranging from how they view socioeconomics to gender roles at these DC schools. The conference ended with the closing ceremonies, which again featured performances by local Houston students and speaker, Baratunde Thurston, Digital Director for The Onion and author of How to Be Black. The whole Field group poses together on their last day in Houston.